ANSI C84.1 is the American National Standard for Electric Power Systems and Equipment – Voltage Ratings (60 Hertz). In 1954, the first version of ANSI C84.1 was basically a combination of the Edison Electric Institute Standard that represents utilities, and the National Electrical Manufacturers Association (NEMA). Currently, the latest version is ANSI C84.1-2011. The standard establishes the nominal voltage ratings and operating tolerances for 60-Hz electric power systems above 100 volts up to a maximum system voltage of 1200 kV (steady-state voltage levels only). However, in this post, the focus will be on ANSI C84.1 Voltage Ranges. Refer to this article for standard nominal system voltages and voltage classes: ANSI C84.1 - Voltage Ratings. ANSI C84.1 specifies the steady-state voltage tolerances for an electrical power system. The standard divides voltages into two ranges. Range A is the optimal voltage range. Range B is acceptable, but not optimal. b. The shaded portion of the range does not apply to 120 V - 600 V s ystems. Please take note that transient voltages (i.e. sags and surges) go beyond these limits and are covered by other voltage standards – ITIC and CBEMA Curves. In addition, the difference between minimum service and minimum utilization voltages is intended to allow for voltage drop in the customer’s wiring. Moreover, this difference is greater for service at more than 600 volts to allow for additional voltage drop in transformations between service voltage and utilization equipment. The National Electrical Code (NEC) allows up to a 5% drop – up to 3% drop in the main feeder and an additional <3% in individual branch circuits. 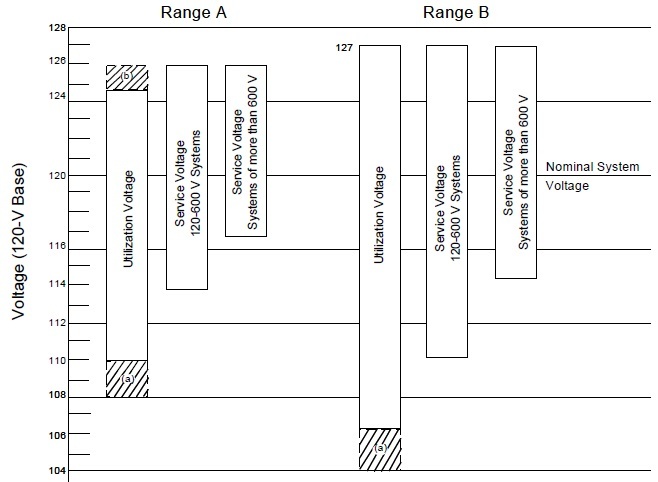 Therefore, for common nominal system voltages, the recommended range as per ANSI C84.1 for 120 V - 600 V systems will be as indicated below. The occurrence of service voltages outside the Range A limits should be infrequent. Range A must be the basis for the utilization equipment’s design and rating in order to give satisfactory performance. Range B necessarily results from the practical design and operating conditions on supply and/or user systems, which are part of practical operations. However, such conditions should be limited in extent, duration and frequency. Corrective measures shall be undertaken within a reasonable time to bring back voltages within Range A limits, in cases of Range B values occurrence. Furthermore, it should be recognized that because of conditions beyond the control of the supplier and/or user, there will be infrequent and limited periods when steady-state voltages exceed Range B limits. Utilization equipment may not operate satisfactorily under these conditions, and protective devices may operate to protect the utilization equipment. Kusko, A. and Thompson, M. (2007). Power Quality in Electrical Systems. New York: McGraw-Hill.